It’s 1914. 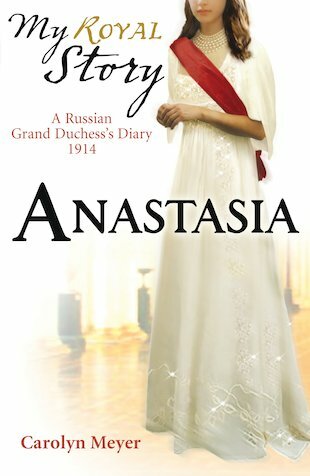 Grand Duchess Anastasia, youngest daughter of the Tsar, is leading a privileged life in the grand palaces of Russia. But unbeknown to her, a revolution which will shatter all she loves is just around the corner. As the First World War takes hold, the Bolsheviks launch their deadly assault upon the Tsars. The royal family is arrested and exiled to Siberia, and the life Anastasia knows is swept away forever… Spanning the last four years of Anastasia’s life, this true story paints a moving portrait of one of Russian history’s darkest hours. I loved this book so much! It made we want to find out more about Anastasia and her family. Not only did I learnt lots about the Bolsheviks and revolutions and the war, it was a great story that was very interesting. Interesting, I got to know more about the Russian Tsars. I really love this book and it made me want to find out more about the Russian Tsars. this book isabout a young girl and init are all the things that go on in her life told in a diary format.